Across the country, we hear about the pressing need for fresh ideas in an evolving education landscape. Pathway 2 Tomorrow: Local Visions for America’s Future (http://www.p2tomorrow.org) today announced a major Innovation Award for submissions of agile education solutions to transform state and local outcomes in both K-12 and higher education. The recipient of the Innovation Award will earn $100,000 to develop the solution into an expanded implementation plan at scale in their community. P2T seeks innovative and bold solutions that are research-informed, implementable, and drive measurable outcomes, with a presumption of high expectations for all students. Solutions can effect change across the spectrum — from early childhood education to career readiness and anything in between – accelerated by input from a broad range of entrepreneurs, educators, parents, students, business leaders, advocates and researchers. In the first stage of the selection process, P2T will select a certain number of proposals to receive $15,000 apiece for use in developing high quality implementation plans. The Innovation Award of $100,000 will be given to the top applicant with the most effective and innovative plan for improving education. The deadline for submissions – with nothing more than a 3-page proposal required – is August 31st. Detailed information regarding proposals, including required components, submission instructions, webinars walking through the process, evaluation criteria and timelines, is included at http://www.p2tomorrow.org. 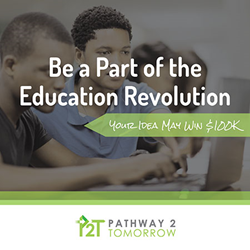 P2T – backed by respected local and national voices and more than 50 partners in education, business, and innovation – wants to bridge the gap between seasoned education policy advocates and local researchers, entrepreneurs and classroom teachers who have promising ideas but limited policymaking experience. For more information about the P2T initiative and its Call for Proposals, visit http://www.p2tomorrow.org.